Don’t let the summer pass you by without trying the FlyBoard! FlyBoarding is the most fun you’ll have on the water – Guaranteed!! Come to our Lakeside location inside Nashville Shores at Cap’n Dave’s Water Sports for a Labor Day Bash like no other! We’ll cater to you and your group, and provide a fun, private, spot on Percy Priest Lake to spend the day Flyboarding, swimming and hanging out on our 8′ x 6′ party islands. Bring your own food & drinks, we’ll provide the grill. Find out what everyone’s raving about, and send out the summer right with an awesome day on lake and Nashville FlyBoard! Our Lakeside location is available to host Group Flyboard sessions now through September, any type of event! 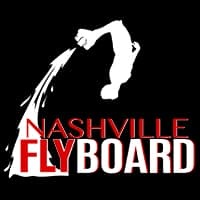 Call 615-580-9030, or email booking@nashvilleflyboard.com. Book Now! Real time booking available for Labor Day Event. Choose the Calendar Icon, then September 5 for available times. Flyboard® is a registered trademark of Zapata Holding. Copyright © 2019 Nashville FlyBoard, LLC All Rights Reserved.